Carol Burnett wishes she’d been asked more about...George Clooney?! “They said I was drunk in a Washington restaurant and that I was pouring wine on Henry Kissinger. Of course, none of that happened and in fact,Dr Kissinger was deposed. He did a deposition on the whole thing…and I won.” - Carol Burnett on her victorious lawsuit against the tabloids. “‘Is it true what’s going on between you and George Clooney?’ would be interesting.” - Carol Burnett on what she wishes she’d been asked about more. “I said, ‘Okay God. I’m going to open my mouth. I don’t know what’s going to come out, but whatever comes out is your fault.’ And I said, ‘I’d be Osama Bin Laden and I’d kill myself.’” - Carol Burnett on who she would be and what would she do if she was able to trade places with someone. “When I was going to do my show, CBS wanted me to do sitcom. I had a pretty wild contract that was unheard of at the time that said if I wanted to do a one hour variety show, I could push the button and they would have to put it on whether they wanted to or not. Thirty one hour pay-or-play shows.” - Carol Burnett on her controversial contract with CBS. “Wouldn’t it bug you if women got paid more than you did?” - Carol Burnett on the Hollywood wage gap. “They said, ‘Carol, it’s a man’s game. It’s Gleason, it’s Sid Caesar, it’s Milton Berle, now it’s Dean Martin.’ But I said, ‘That’s what I want to do. I don’t want to be the same person every week. I want to do different characters.” - Carol Burnett on the discouragement she received as a woman regarding her preference of ‘variety’ over sitcom. “Well, I’m not really into that that much. What I’ve heard and read, people are saying that it’s really kind of the fault of the people who choose the scripts, choose the material, and choose the directors, so those are the higher ups. 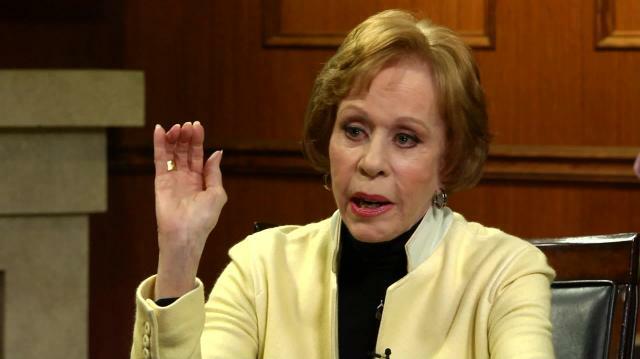 As far as the voting goes, you really want to vote for the best performance.” - Carol Burnett on the oscars controversy. “Variety could come back. There’s a talent here to do it. There’s plenty of talent. It all depends on how they would couch it.” - Carol Burnett on the revival of variety shows. “A comic says funny things like Bob Hope. A comedic actor says things funny like Jack Benny. And I thought, ‘Ahh. That’s what I want to do. I want to say things funny.’” - Carol Burnett on the difference between a comic and a comedic actor. “It was going to be known and I didn’t want any of the tabloids to break the news, so I talked to Carrie. We talked about it as a family after she had gone through rehab and we said, ‘WE should talk about it.’ And so we called up People magazine and had this wonderful reporter come and it was the cover story. That way none of the tabloids could touch it.” - Carol Burnett on going public with her daughter’s drug addiction.